Capital cost is the primary consideration for most construction projects. However, designers and contractors often fail to account for all the costs relating to a pipeline installation by focusing only on the cost of the pipe. This can lead to missed opportunities; significant installed cost savings can be made by properly addressing the structural design of the installation. Pipelines of different materials can be considered structurally as rigid or flexible systems. Concrete is a rigid system and as such, the strength and structure of the pipeline comes mainly from the pipe itself, achieved in a controlled factory environment. In contrast, a flexible pipe acts only as a conduit and the construction of the supporting structure takes place on site where the integrity of the system is heavily reliant on the design and quality of the installation. Excavated material can be re-used as backfill. Less imported granular material required. Time saved during the infill and compaction cycle. Reduced disposal of waste to landfill. As for the pipes themselves, estimating future costs is reliable given the relative price stability of concrete, particularly when compared with oil derivatives which can be affected by surges in crude prices. Concrete pipes also have the benefit of high performance, integrally-cast seals so there are no “hidden costs” in terms of additional gaskets or connectors. Health and Safety Best Practice (as set out in HSE Guidance for manual handling) advises against manual lifting of most flexible pipes > DN300. On this basis, costs associated with mechanical lifting plant are comparable with rigid pipe materials. Another development within the concrete pipeline industry is the introduction of a special pipe lifter. Use of the lifter can remove the need for operatives on the back of lorries during offloading and save considerable cost and time. Use the structural design calculator to find out what bedding design in required for your project. Use the material cost calculator to compare alternative designs. 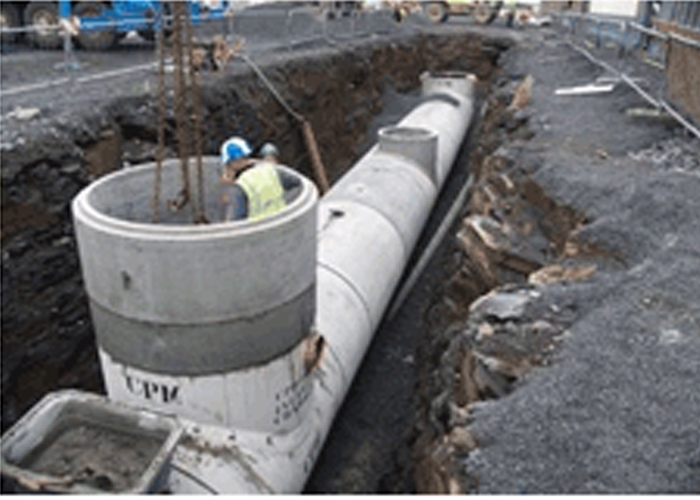 This calculator simplifies the main concrete pipeline design calculations. It offers all the basic values; from design loads (We), to bedding factors (Fse) and required BS Strengths (Fn) and then recommends a bedding class. The aim of this calculator is to help designers and contractors estimate the material cost (including bedding and pipes) of installing different types of sewer pipeline systems.